DELICIA 96 SPECIAL 37-96 4 Musette 11+5 Black DISC. With the realisation of my website, I have decided to try a new approach with these instruments and offer my customers the opportunity to buy any of them at a fair price on a 'sold as seen' basis. Most of the instruments on this extra list should have a complete overhaul done to the reeds but I have had many enquiries for cheap accordions so that someone would get an idea of playing without having to spend very much. Some of the accordions may not be as cosmetically pleasing as I would want, but in my experience I have spoken to many customers who are not concerned about the looks. In some instances, some enthusiasts may be 'handymen' willing to have a go themselves at certain repairs as long as the instrument is generally playable in the first place. Ideally, it is not what I would like to do but that said, with such a huge stock I simply do not have the space to store or the tme to carry out the necessary work. 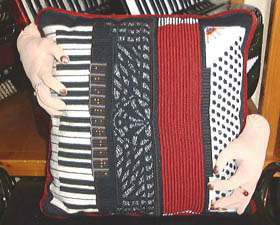 However, if the particular accordion you buy should be exactly what you are after and you do want the overhaul done by me, then it can be booked in to have any necessary work done at a later date. All Accordions, come complete with straps, case and full three year guarantee.